Funter is a user-friendly utility to show, hide, and unhide hidden files and folders on Mac. It was designed to help users switch the visibility of hidden files. 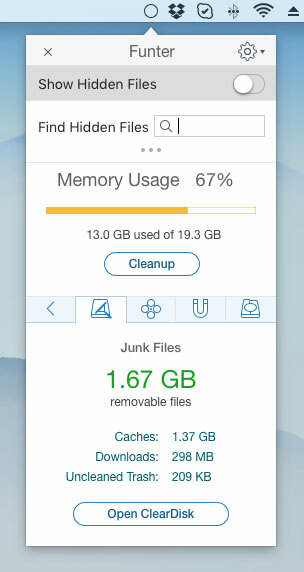 The app enables displaying hidden files in a quick and easy way without having to be a computer geek and use special system commands. 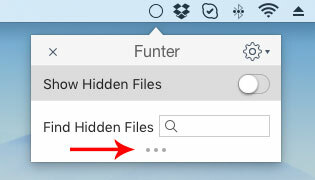 Funter is absolutely free to download and use, and even allows you to find any file, even those files the Spotlight never shows, especially hidden files. You can learn more about Funter’s main features in its User Guide. In this article, we would like to take a look at its additional features and show how you can optimize your iMac or MacBook with Funter. 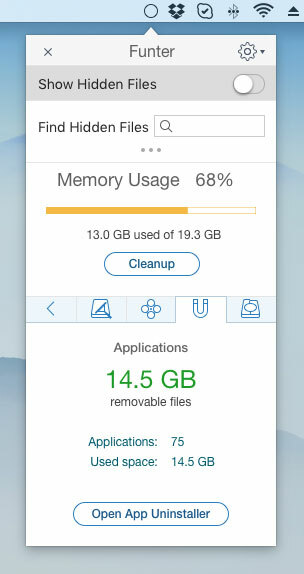 Funter has a built-in smart option which shows the system usage on your macOS. To view it, click on the app’s icon in the Menu bar. If the information is hidden, click on the three dots in the dialog window. How much RAM memory is used. 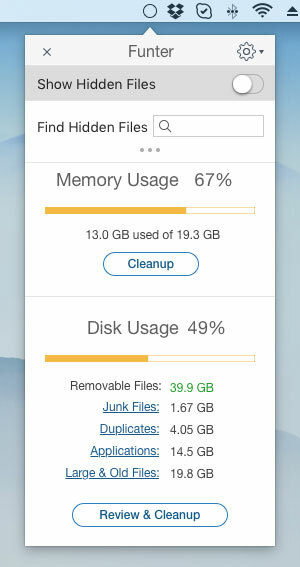 A lack of free disk space is one of the reasons your Mac is slow and why it sometimes hangs. 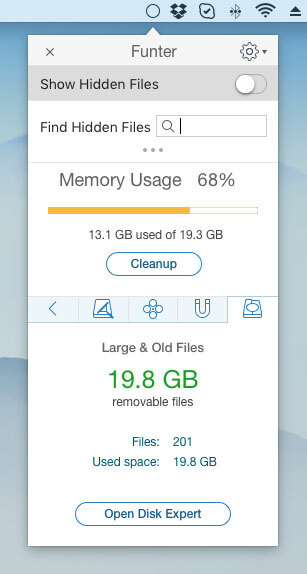 This is a sign that you should clean up unneeded files (caches, service files, leftovers of apps, duplicates and so on) to free up more space on your Mac and, as a result, speed up it. This was a quick review for those who are struggling to find free space on their Macs. As you can see, Funter is a tool not only for operating hidden files but also for optimizing macOS or OS X systems.